A quick stitch patriotic design redwork style. The fireworks look great when stitched in variegated threads and even ,better in variegated metallics! In 4x4 this design fits anywhere. 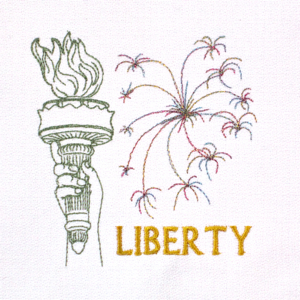 Great for for quick stitch home embellishments for your 4th of July party, from napkins, placemats & aprons to a patriotic tee! Stitch a bit of American Pride today! Torch art from Doodle Pantry. Doodle Pantry allows for personal and craft for sale use of their work. Permisssions exclude commercial use, logos and use by organizations.